This research aims to uncover the identity of the ideology and practices of the religious Sorority PTKI Se-Metro City about hijab. This important research is done because of the assumption that the use of certain types of hijab is the symbol of extremism and radicalism. First, the existence of the facts users Hijab and veil that are involved in terrorism. In this study, the researchers used a qualitative research method. Data networking is done by the method of conversing and listening. Researchers conduct interviews and record the results of the interviews in the form of sound or video. As for the theory used in exposing the identity of the ideology and practice of religious students about the veil is a religious dimension to the Glock and Stark. As for the findings from this research are (1) the use of the veil distributed by the ideology of syncretism that fall into the category of space in between. But the identity of the space in between is so potentially could be changed, both moved on to understand the extreme about hijab and veil or more moderate in understanding that the veil is not a compulsory subject. (2 user veil that has extreme religious ideology of familiar and has been crystallized. Students who have learned not to mention could have contested the pattern she thought. But in their religious practice has three types of practices, syncretism, moderate and extreme in understanding hijab. â€œIstri Suyono Mengaku Dapat â€˜Uang Damaiâ€™, Benarkah dari Densus? | Republika Online.â€ [Online]. Available: https://www.republika.co.id/berita/nasional/hukum/16/03/29/o4sf9t377-istri-suyono-mengaku-dapat-uang-damai-benarkah-dari-densus. [Accessed: 26-Dec-2018]. â€œPenyebaran gerakan khilafah di kampus menguat pascareformasi - BBC News Indonesia.â€ [Online]. Available: https://www.bbc.com/indonesia/berita_indonesia/2016/05/160510_indonesia_lapsus_radikalisme_anakmuda_kampus. [Accessed: 26-Dec-2018]. M. Bernard, Fashion Sebagai Komunikasi. Yogyakarta: Jalasutra, 1996. Deni Sutan Bahtiar and Pritti, Berjilbab & tren buka aurat. Yogyakarta: Mitra Pustaka, 2009. M. Q. Shihab, Jilbab: pakaian wanita Muslimahâ€¯; pandangan ulama masa lalu dan cendekiawan kontemporer, Cetakan 6. Jakarta: Lentera Hati, 2012. A. Musaddad, â€œHubungan antara Jilbab dengan Perilaku Islami,â€ in JKPI, UIN Jakarta, 2008. S. S. Fadholi, Sosok wanita muslimah: pandangan seorang artis, Cet. 1. Yogyakarta: Tiara Wacana Yogya, 1993. G. Burton, Media dan Budaya Popular. Yogyakarta: Jalasutra, 2012.
	â€œâ€˜Istilah Jilboobs penghinaan bagi perempuan berjilbabâ€™ | merdeka.com.â€ [Online]. Available: https://www.merdeka.com/peristiwa/istilah-jilboobs-penghinaan-bagi-perempuan-berjilbab.html. [Accessed: 26-Dec-2018]. A. Nurafifah, â€œJilbab sebagai fenomena Agama dan Budaya,â€ Yogyakarta, 2014. W. Eka Putri, â€œRealita Sosial dan Pemahaman Syariâ€™at,â€ Yogyakarta, 2011. M. Aki, Memahami Riset Perilaku dan Sosial. Jakarta: Bumi Aksara, 2014. A. B. Nasution, INSTRUMEN INTERNASIONAL POKOK HAK ASASI MANUSIA. jakarta: Yayasan Obor Indonesia, 2006. M. Ali, Memahami Riset Pelaku dan Sosial. Jakarta: BumiAksara, 2014. 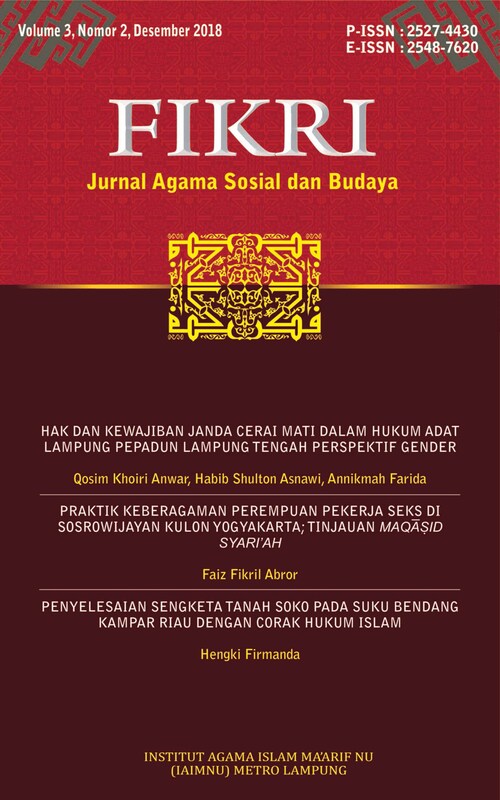 M. A. Mushodiq, S. Suhono, B. D. Pratiwi, and E. Zuliana, â€œKristalisasi Ideologi Islam Nusantara melalui Pembelajaran dan Pengadaan Kaligrafi,â€ FIKRIâ€¯: Jurnal Kajian Agama, Sosial dan Budaya, vol. 3, no. 1, pp. 143â€“172, Jul. 2018. J. T. Wood, Interpersonal Communication: Everyday Encounters. Cengage Learning, 2015. M. Sutrisno, Ed., Cultural studies: tantangan bagi teori-teori besar kebudayaan. Kukusan, Depok: Penerbit Koekoesan, 2007. M. A. Zahrah, Ushul Fiqih. Jakarta: Pustaka Firdaus, 2010.